I am back from a wonderful weekend as the guest of the Blomstervenners Klubb at their Study Weekend in Vettre, close to Oslo in Norway, where I met many very friendly and enthusiastic gardeners. I was very well looked after and enjoyed the lectures by the other two guest speakers, Finn Haugli and Henrik Zetturland as well as the visits to some stunning private gardens and the Oslo Botanic Garden. So where are the pictures, you may well ask? Well, the taxi to take me to the airport arrived 10 minutes early and it is my excuse that this caused me to forget to pick up my camera and spare batteries, laid out ready to go on a plan-chest in my studio, next to my passport; how could I miss you? Is this a senior moment? It can't possibly be, I am far too young for that, in fact, if I had not been going to Oslo, I would have been off to see those other youngsters, The Rolling Stones, performing in Hamden. 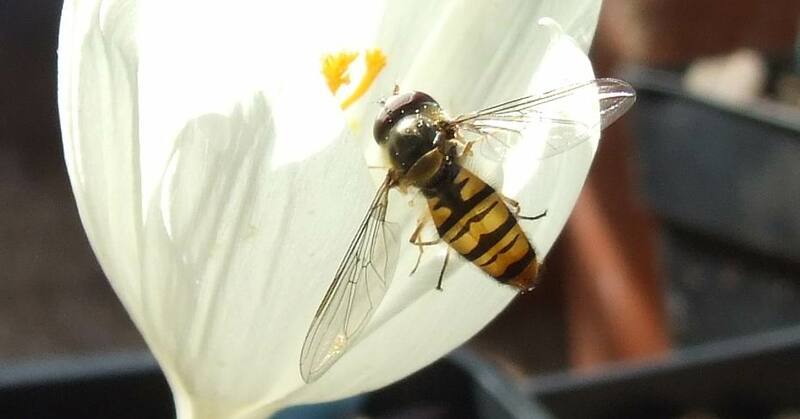 It is amazing how the hover flies are attracted to the Autumn crocus flowers, as soon as the first flower opens the flies home in on it, especially when I take them into the glass house to enjoy the flowers. While they go in and out of the flowers many times, the flies cannot be relied upon to fertilise the flower properly by transferring sufficient pollen grains onto the sticky and receptive stigma - if you want to get seed, which you should, then you must get out your paint brush and assist nature. Who does this in the wild then, I hear some of you asking? No one, but our gardens are a very artificial environment and far removed from the wild habitat where plants have evolved together with specific insects for thousands of years to ensure an efficient pollination is achieved. While the crocus are still successful in attracting our hover flies to their open flowers, the flies in our area may differ in shape and be fewer in numbers than the primary pollinating insects of the regions of Turkey where Crocus vallicola is native. 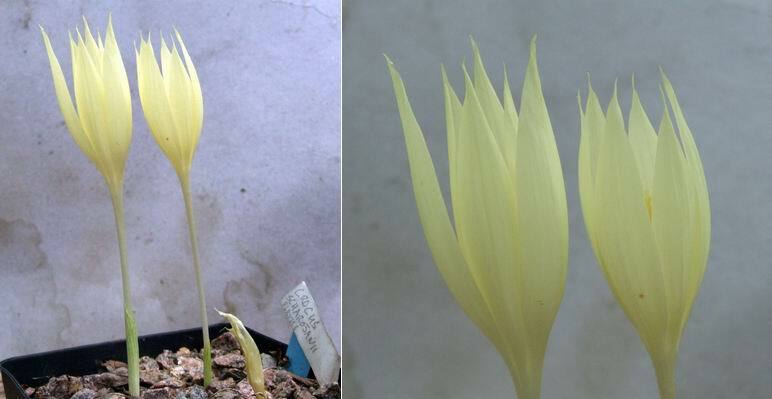 A few logs back I showed you a picture of the deep egg-yolk yellow Crocus scharojanii in flower and this is the paler version var flavus. 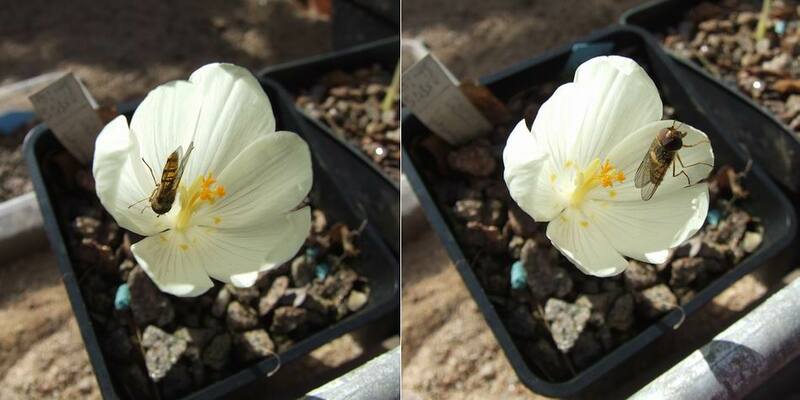 Crocus scharojanii var flavus is almost certainly the result of hybridisation in the wild between Crocus scharojanii and C. vallicola and, as such, I think it should have its own name. If it is a fertile hybrid resulting in stable populations in the wild then why is it not a species? In spite of the fact that I have been growing bulbs for tens of years I never cease to be amazed at how quickly they shoot into flower, especially the autumn flowering ones. This is an old favourite of mine that I call Colchicum tesselated hybrid - I know it will have a cultivar name but I do not know what it is as we got it from a very old garden where nothing was named. It is interesting to note how the light changes how the camera sees the colour; the centre image was taken when the sun shone through the clouds for a second, making the colour seem much deeper than it is. Also notice how the contrast caused by the shadow is much greater in the middle one - this is one of the reasons why strong sunshine is not always the best light to be taking pictures in. My favourite lighting for plant photography is found when we have high white cloud which gives a good flat light intensity and low contrast and when the sun breaks through I am often heard mumbling, hey, you get off of my cloud. This picture also illustrates the problems of high contrast in a subject with the sunny background being almost burnt out while the shadowed foreground is hardly visible. One of the good things about digital photography is that we can easily manipulate the image brightness and contrast to improve the result and the image on the right has been been very slightly adjusted. Basically, contrast is the variation between light and dark, a bright sun gives very bright highs and very dark shadows resulting in high contrast while the light levels in cloudy conditions reduce the variation between the highlights and shadows; all photographic mediums can record this much better. High contrast can be used to good advantage in some photographic situations. Getting in close and taking the exposure reading from the main subject gives us a much clearer result, mostly because we have reduced the contrast range to a level that the photographic medium can handle. We must always remember that when we look at a scene our brains are continually manipulating the image we see by enlarging or reducing the size of our pupils, our aperture, as well as applying very sophisticated software in our brains to make sense of the view in front of our eyes. 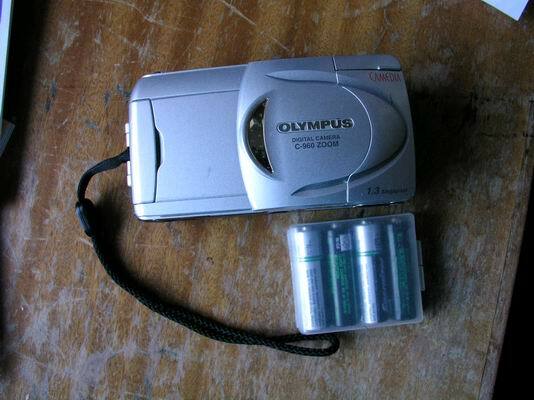 Cameras are not that clever and we must make allowances for this when we are taking photographs and not be a fool to cry about the difficulties. Although we have not got the mass displays of cyclamen that some of you have, and which I envy, we are starting to get some forms that will accept our cooler acid conditions. In the foreground, Cyclamen hederifolium grows in a gravel path with Phyllodoce caerulea which is very happy in our conditions, producing a second flush of flowers of this season - this could be the last time it flowers this year. By continually raising cyclamen from our own garden seed we will gradually select a strain that is most suited to our garden. 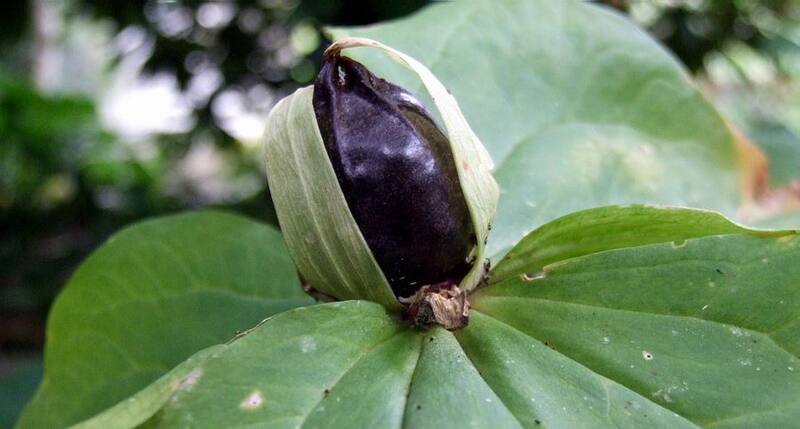 Another thing we need to be on the look out for at this time of year is the ripening of some trillium seed pods. Looking at the top of this seed pod there are no signs of it splitting open yet so there is no need to panic, or is there? That is not the way it happens in these trilliums - they do not open from the top. When they are ripe they just drop off from the plant and the seeds are shed on the ground -that is if they have not been raided by wasps like my Trillium ovatum. 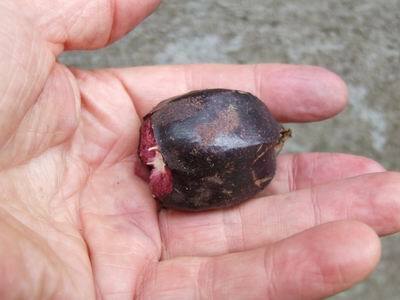 The seed pods can be quite large as this one under my thumb illustrates. Once on the ground the sweet appendage makes them irresistible to ants that will make off with all your valuable seeds as if they were brown sugar giving me no satisfaction at all and sticky fingers leading to my 19th nervous breakdown. You can rub off the gummy residue by rolling the seeds between yesterday's papers. Thank you for your response to my pet dandelion, it is well known that dandelions will make you wise. Don't fret over your dead flowers, let me know all down the line in the Bulblog Feedback pages how many Rolling Stones song titles I've snuck in this log.